Born in the north of France near the Belgian border, Pavard first played with his hometown club in Jeumont – the same place it all started for former Bayern Munich and France striker Jean-Pierre Papin. At the age of nine, he joined the academy at Lille, and four times a week his parents would make a 60-mile round trip to bring their son to training and back. The dedication paid off, as Pavard made his Ligue 1 debut at the age of 18 in January 2015. A move to Stuttgart followed in August 2016, and Pavard – the son of a former French third division defender - will always be thankful to his parents for helping it happen. The promising centre-back then started all 34 matches on Stuttgart’s return to the top-flight, part of a squad that secured an impressive seventh-place finish in 2017/18. Not surprisingly, his rapid progress was rewarded with a new contract in December 2017, which ties him to the 2007 Bundesliga winners until 2021. Watch: What makes Pavard so good? Schooled as a centre-back, where he plays for VfB, Pavard is also able to operate at right-back – like he does for France – or in defensive midfield. That flexibility is a big plus and one of the reasons he played over 3,000 minutes of Bundesliga football in 2017/18. Last season he was one of only four players in the entire Bundesliga not to miss a second of league action, alongside Matthias Ginter (Borussia Mönchengladbach), Naldo (Schalke) and Christian Günter (Freiburg). The only game Pavard missed in 2017/18 was a DFB Cup match – which Stuttgart lost in his absence – after the defender broke his nose in a 1-0 defeat to Bayern on 16 December. The injury came about as a result of a collision with teammate Chadrac Akolo, but the fighting Frenchman carried on playing until the end nevertheless. He played in a protective mask in early 2018 as a result, and his presence in central defence was vital at the business end of the campaign as Stuttgart conceded only 10 goals in their final 14 Bundesliga matches. Speaking during Les Bleus’ incredible World Cup run in July 2018, Pavard was blown away by how quickly he had won over the country. “It’s a bit strange because people hadn’t necessarily heard of me before,” he said in an interview with the French Football Federation. And the French fans’ songs did not go unnoticed by Pavard himself. 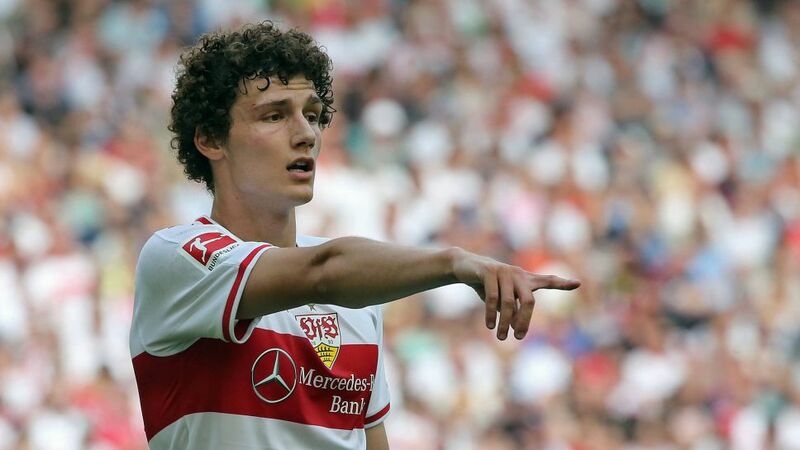 Pavard’s first strike for Stuttgart was a thumping header against Fürth in the second tier. His maiden top-flight goal came on Matchday 10 of the 2017/18 season, a delightful back header during a 3-0 win over Freiburg. He then got the whole world’s attention with that breathtaking equalising goal against Argentina. Leaning back as a cross from Lucas Hernandez found its way to the right side of the area, Pavard showed sumptuous technique to slice across the ball and send a swerving, first-time volley screaming into the top corner. Following the World Cup, Pavard told L’Equipe that it was a type of volley that he likes but tries rarely. Pavard is very close to his parents, who travel six hours to go to every Stuttgart home game. When they surprised him with their video message following THAT goal against Argentina - telling him how proud of him they are - the rising star could not hold back the tears. “I won’t ever be able to thank them enough for all they did for me,” he responded. Pavard has often stated that his first goal is to make his mother and father proud, and he certainly did that in the summer of 2018 as he helped France become world champions for just the second time in their history. Speaking after the 4-2 win over Croatia in the final, he revealed that he had also cried during the match as the reality of what he had achieved started to hit home. “Two years ago [at Euro 2016] I was in the fan zone in Lille with my friends,” he told French TV. “A year ago, I was playing in the German second division.